Our weather this year in Maryland has been a sprinkle of this and a dash of that. We have had high temperatures in March and low temperatures today, which today we are in the month of June. It is no secret that my family enjoys a lovely bowl of soup all year round. This is a basic recipe, that I am sure most of you make and probably use a little of this and a little of that to add flavor, texture and deliciousness to satisfy your families taste buds. I usually make this right after I have bought a rotisserie chicken from the grocery store. It's true, I cannot resist the aroma of the chickens cooking in our local grocery store. Sometimes I have a lot of meat still left on the bones and other times it's slim pickings. If you don't have the amount of meat that you would like, then you can add a can of cubed chicken, cook up a couple of chicken breast or add a few thighs to the stock pot. I like to combine the dark and white meats in my chicken soup. 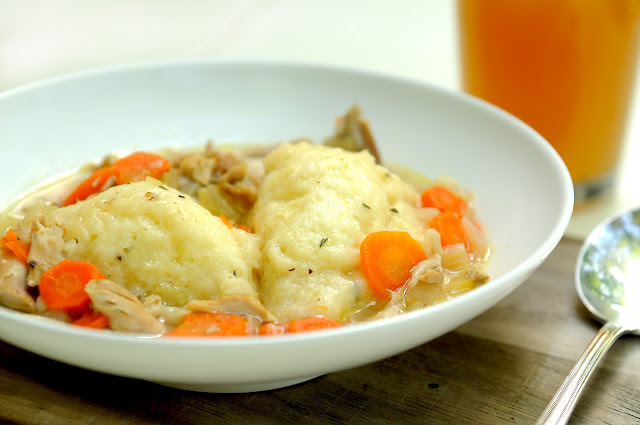 When I was a kid our chicken and dumplings were prepared with diced potatoes in the soup, served with mashed potatoes on the side and of course, they had dumplings. That is a lot of starch. We have learned a little bit since I was a kid of what might be considered too much.LOL Oh, but it did taste good! This is a lighter version of what I grew up with: no mashed potatoes and the diced potatoes are an option. In a large stock pot, add the chicken carcass (or thighs), water, bouillon, garlic and pepper. Let simmer for 60 minutes. Taste the broth and see if it is to your liking. Add salt or more bouillon to match your taste buds. Remove the whole chicken or thighs. Scrape the bottom to try and get any bones that may have slipped to the bottom. This can be a hot process. Let the chicken cool or use two forks to remove the meat. Remove all of the meat from the bones. You can add as much meat as you would like. I always start with three cups and go from there. While you are removing the meat from the chicken you can let the veggies cook. Add the carrots, celery and onion. Let cook until carrots are tender, about 15 minutes. If you choose to add potatoes, this cook time may be increase based on their doneness. Add chicken and let soup simmer while you are making the dumplings. When ready to add the dumplings, I like my soup to be boiling. 1/2 teaspoon of thyme. I like to add some dried herbs to make the dumplings look pretty. In a medium bowl, combine flour, salt, baking powder, dried herb and baking soda, mixing well. Cut in cold butter using a pastry blender or you can grate your butter, instead of using a pastry blender and toss together with your hands. Add cold buttermilk, a few spoons at a time, mixing the dough from the outside in with fork until a soft dough forms (do not overmix - about 2 minutes total). Based on where you live you may need to add a bit more flour or buttermilk, do so sparingly. The dough should not be too wet or too dry. 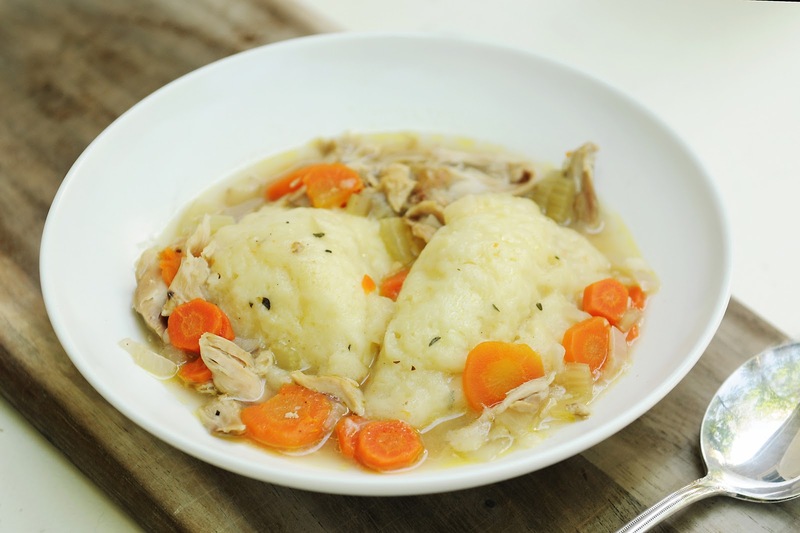 You have two options to adding your dumplings to the chicken soup. You can roll out the dough to 1/4 inch on a lightly floured surface and cut them into strips or use a round cookie cutter OR you can drop by spoonfuls. This is the method I have always used. I try to make sure that when I place the dumpling in the soup that I spread it out a bit so that it's not too thick and they cook through. Add dumplings to boiling soup and cover. Let cook for 15 minutes on medium heat. Try not to remove the lid before the time is up. The steam is what will cook the top of the dumplings and when you crack the lid it releases the steam. My family can never get enough dumplings or carrots. I'm sure this will be a hit. When I take the chicken (or turkey) out of my broth so I can de-bone it I usually pour the broth through a colander into a second kettle. It makes it so much easier - as long as your careful so you don't burn your arms with the steam. Thanks for the recipe.